← Mail Sack, various topics, 12 /5/12. I wanted to mention this earlier, but about a week ago I was Down at Arnold Holmes’ hangar at Leesburg FL doing some background work for Corvair College #25 in April 2013. (sounds like a long time from now but it’s about 120 days.) Arnold has a very impressive aircraft maintenance business named AV-MECH, specializing in twin-engine aircraft. He also one of the very few shops in the country that does heavy structural repairs on Certified composite aircraft. In his shop he had a Columbia (Cessna)350. 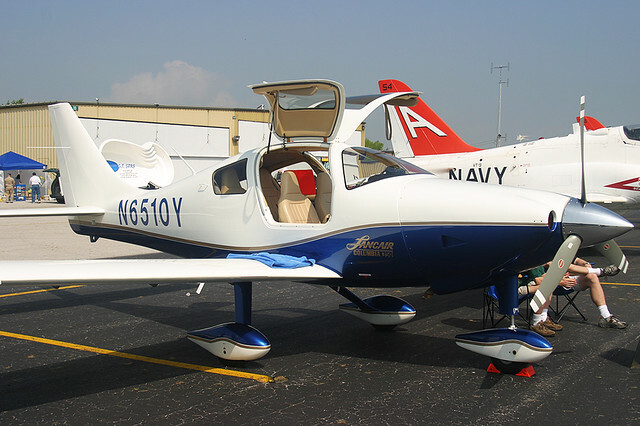 This aircraft traces its origin back to the Lancair ES. Lancair formed Columbia to have a certified division, brought in a lot of European money, the money came with an investor stipulated test pilot, who crashes it, project slows down, good people leave, things stagger on, Cessna feels that they need to compete with Cirrus on composite planes, they buy the design, come up with a very clever outsourcing plan to have the airframes built in Mexico, aircraft get an AD because the wing skin and spar delaminate, whole project comes to a grinding halt, Cessna website deletes all references to the design. They fire their CEO, same guy becomes head of EAA. Works like magic. Didn’t read this story in your membership magazine? Cessna is a big company with money. Remember when they brought 172’s back in the late 1990s and it turned out they were planning on selling them for $200,000 and every working class guy in aviation said they were on drugs because you can’t sell a 172 for the price of a 4 bedroom house. I said it too, and guess what, I was wrong. In a decade of production Cessna sold almost 9,000, yes nine thousand, planes to people who don’t think a quarter of a million bucks is expensive for a recreational vehicle. With sales like that, you can buy a lot of things like gigantic booths at airshows, lots of full-page adds, and evidently a lot of editorial position in publications. I bring this up so that traditional homebuilders have a better picture of the 800 pound gorilla in the room, and have some understanding of how much influence these people have over the things we read, the content of our airshows, and the direction of our membership organization. Think about it. OK, back to subject #1, cowl inlet area. About 175 350s have been built over the years. They are FAR-23 Certified aircraft, which means that they have enough wing area and lift to stall at 61 knots or less at gross weight, in this case 3,400 pounds. What this means is the aircraft has a climb speed of less than 100 mph. This isn’t a stol aircraft, but it isn’t climbing at 160 kts like a Lancair IV. The plane does not have cowl flaps. The engine is a 310 HP, 550 cubic inch 6 cylinder Contintential. Guess what? The cowl inlet is a shade under 5.50″ in diameter. In recent posts I have pointed out that I suggest 4.75 to 4.875″ for aircraft that climb at the 601/650 speed, and 5.00″ for the Zenith 750. Look at the HP/inches of inlet area of the 601/650, even with a 120 HP Corvair vs the Cessna’s 310 HP numbers: The Corvair is 3.38 HP cooled by each square inch of inlet, vs the Cessna which is 6.52 HP cooled by each square inch of inlet area. Consider this another piece of evidence that the Corvair nose bowl we make and sell actually has plenty of inlet area for the work we are asking it to do. We have all heard the saying “If you’re so smart, why aren’t you rich?” I don’t know when this started, but it implies that wealthy people have some extra special allotment of brains. Follow through with me on the next few paragraphs and I think that we can put an end to any claim that people with money enough to buy really expensive aircraft have some better level of intelligence or judgement. At the end, I want to share a very important observation on a particular type of pilot, an observation you need to understand to manage your own person risk. OK, is any one else tired of hearing other pilots say that Experimental aircraft and their builders are less safe than people in factory built planes? The Guy actually opened the door, when the POH explicitly said to never do this in flight. Then, he chooses to fly the plane 60 miles to a service center instead of landing it. I have three questions: 1) did the FAA violate him for not taking the first airport available? If not, they are not serious about anything. 2) who was his insurance company, did they pay out, and how much did this raise the rates of every other 350 operator who actually reads the POH? 3) Does the owner of this plane think that the people who build homebuilts are “unsafe and have poor judgement.”? In a story a few days ago I told the story of the Cirrus marketing guy from the China home office making the claim that his companies aircraft were exceptionally safe, and how he was laughed at. If you would like to read a very well written article that points out that Cirrus actually has a terrible safety record, look at the link below. OK, so you’re not in the market to buy a Cirrus because you object to the litany of moral crimes committed by their ownership, the red Chinese government. The article still has a very important point in it for the rest of us. If you read the man’s whole article, he states that there is nothing wrong with the design, but he feels the evidence clearly shows that these aircraft are marketed to unqualified pilots, and the need to improve their skills is down played/swept under the rug by the Cirrus marketing team. They push the parachute in the aircraft as an ‘out’ for pilots who exercised poor judgement. He gives examples of how Cirrus marketing attempts to only address a favorable spin on the data, intentionally steering potential customers from correctly understanding the risk involved. As a traditional homebuilder you need to understand that homebuilts need to improve their accident rates, but they are nowhere near as bad as some people make them out to be. Most of the accidents in homebuilts are caused by second owners who bought their planes and didn’t bother to learn anything about them. In this way, they are acting like the people Cirrus found easy to market to. Being wealthy doesn’t make you a bad person, but everyone understands that many of these people have the “I paid for it, I’m going to fly it” mentality, a certain hubris that working class Joes have at a vastly lower rate. This is nothing new. Vee tailed Bonanzas were called “Doctor-Lawyer killers” for a reason. Just like the Cirrus, it isn’t the plane, it is the people flying it, and the common thread is that marketing people found successful people with money and they downplayed the risks and required skills, because that would just hurt sales. As a homebuilder you need to know that there are the same type of salesmen working the kit market also, and our current journalists are not very likely to call anyone out. You have to open your eyes and make good decisions for yourself.